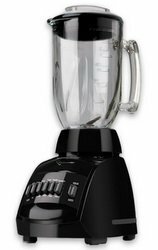 Black and Decker Cyclone 10-Speed Blender - Black. Unique 48 oz. Cyclone Glass Blending Jar design helps keep ingredients in the path of the multi-level stainless steel blades. 650 watts of peak power and 10 speeds plus pulse for salsas, smoothies, shakes, soups, stews and more! 2-oz. Measuring Cup Lid Insert and Perfect Pour Jar Spout. Cord Storage with Dishwasher-Safe Lid. Stars Based on actual user experience and reviews, this blender is RATED LOWER THAN AVERAGE by 16 USERS and ranks in the BOTTOM 14% of all blenders. 20% of users rate this blender favorably. The goofy little top which is supposed to be a measuring cup I guess continually comes off the unit. I also had the experience of it leaking no matter how tight you tightened it. No matter how well I screw on the black plastic jar base to try and tighten the gasket, it just keeps on leaking! I haven't even used it yet! You can't make anything with this blender if it has ice in it. It just took me 10 minutes to "blend" a smoothie. The blade assembly fell apart on me after 6 months of use, stripping the nut that holds it all together.